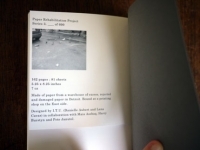 The Paper Rehabilitation Project (with Maia Asshaq & Lana Cavar), was an attempt to collect, archive and make use of scrap paper. This primarily involved using stock found at a high-volume paper recycler that warehoused excess, rejected or damaged paper. 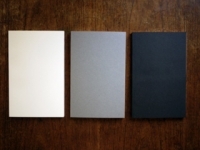 Three project series were produced: Blank Books (series 1 and 3) and Security-Pattern Letter Sets (series 2). The paper used for both of the blank book series was probably originally purchased by printers for their clients, but for one reason or another it was not used as intended. Perhaps it was damaged in transit, or the sheets were jamming the machines, or the job was cancelled altogether. The printer might have made the case to the mill that the paper was unusable in order to try to recoup some of their investment. It ended up on the scrap market where there was a small chance it would be bought by another printer, or more likely it would be shredded and sold (by weight) to a paper mill where it would become the recycled content in a new sheet of paper. It took us a long time to learn of the existence of this paper. Printers, paper distributors, and even many paper recyclers are reluctant to speak of this kind of surplus paper, perhaps because it threatens the commodity status of ‘clean’ paper. We had the feeling that by having it bound into a book we were causing a minor disruption in the circulation of paper. In each series, we captured sheets at this particular moment in time, while they were available, and made paper products that we will never again be able to reproduce. We will develop future series as we encounter paper that needs rehabilitating. The blank books are made in collaboration with Harry Burstyn, who owns Downtown Paper, a high-volume paper recycling business in Detroit, and were assembled by Pete Janutol who owns a printing shop on Detroit’s East side. 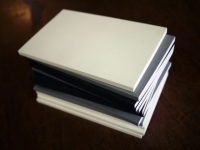 The blank books in Paper Rehabilitation Project, Series 1, contain four different sheets -- Rolland Enviro, Oxford White, Cougar Natural Opaque, and Royal Cotton, manufactured by Cascades, Neenah, Domtar, and Wasau paper companies. We found three different stocks for the covers – blue and gray with a linen finish, and a plum, with a sort of faux–leather finish. Series 3 includes paper of varying weights (40 lb, 50 lb and 60 lb) manufactured by International Paper, Neenah Paper, and Wausau Paper (now owned by Neenah). The Security Pattern Letter Sets include window envelopes that were on heavy discount at a paper distributor. The envelope manufacturer is no longer in business. The letter paper inside was designed to match the original envelope and printed on “reclaimed” paper.